Now many photographers are gadget fiends. If something looks potentially useful, they buy it and then try to find a use for it when they get home. While that may represent one extreme, I tend to fall more towards the opposite. I have to be feeling the pain before I start looking for the solution. So it was when I started looking for my newest, most favorite gadget. As I explained in my first post some weeks ago, I am a fan of older film cameras. I am not really a collector since I pretty much insist that any old camera I pick up be usable and I regularly shoot with all the cameras I own. Now by usable, I mean that most of the cameras features be functional within reason. One of those things that are often broken are the exposure meters on cameras that predate the electronic era. I have a couple of Yashica Lynx rangefinder cameras that date from the early to mid 1960s. While the meters on both cameras react to light, neither is really what I would call functional. I also recently acquired two FSU (Former Soviet Union) rangefinders that never sported a built-in meter. From this small stable of rangefinders grew a persistent pain related to meters. Now I have a hand-held light meter and a very good one at that. My Gossen Luna Lux is easy to use, accurate, and very sensitive in even the lowest light levels. Unfortunately it is almost the same size as any of the above listed rangefinder cameras. and is hardly pocket-able. I did a little research on smaller meters and soon found that some excellent options exist. 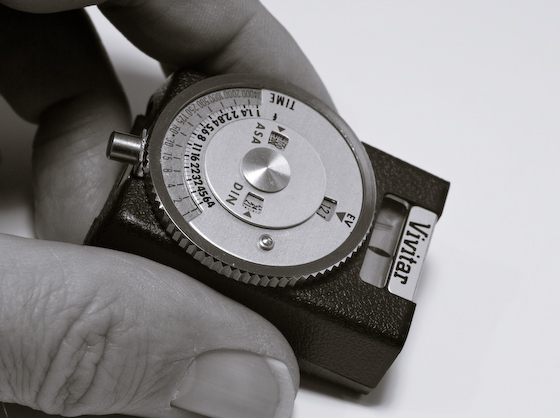 The first option was the quite lovely clip-on VC Meter II made by Cosina/Voigtlander. 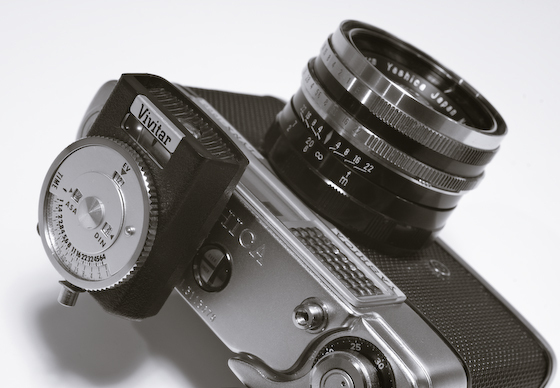 The VC II is designed to fit on the accessory shoe of vintage rangefinder cameras. It was literally made to do the job that I needed it for and is tastefully styled to be compatible with the task. Small, light, accurate, beautiful! What more could I want? How about a lower price? At just under $200 USD street price, it might make perfect sense when paired to a classic Leitz or Nikon rangefinder body, but I am afraid that it is less of a good match for my Zorki, Kiev, or the pair of Yashicas. Well, back to the Internet to find what other options are available. It did not take long to discover that Sekonic also makes a compact clip-on meter. The L-208 Twin Mate has a more traditional appearance than the VC II and is not quite as sensitive, but makes up for it with the ability to take both incident and reflected measurements. While it is not obvious from the product shots, the L-208 is really very small and at a little over $100 USD is closer to what I had in mind, price-wise. And The Final Solution Is? Flip the lever on the back to the left to power on the meter. The meter stays on until the lever is flipped back to the right. If the Vivitar 24 does not look that small mounted on the top of my Lynx 1000, perhaps this photo of the meter hand-held will be more convincing. While this little meter sits quite comfortably on the top of my Lynx, it is of much more recent vintage than the camera. The Lynx dates from about 1960, while the Vivitar 24 was made in the late 1970s. The manual is available on Mike Butkus' Camera Manual Web site should you ever need one. So, in summary...Yes, it really does satisfy the need. It balances nicely on top of the camera and fits nicely in the pocket and plays nicely with the bank account. What a great find! Lovely Gadget! I have an older light meter that shows the metering in terms of candle light. I have the least idea how to use it. Foot-Candles? Good luck on using it with a film camera. I think you would need some sort of calculator or conversion graph. Steve, my analog light meter came with the Rolleiflex and you can see them in this flickr photo set. I don't yet have time to play with it yet, shame! Ping me if you have interest in the Rolleiflex, you have free rental. Also, if you like to try the AF280 flash, feel free to ask for a 1 month rental. Thank you so much for your contribution. Hi Steve, I didn't realize you were a second contributor to this blog. I've been looking around for a compact meter too as I also have a pair of large Gossen meters similar to the one you mention. They're nice but very chunky - part of the price to be paid for using still-commonly -available standard 9V batteries. I don't know that the clip-on aspect is all that important to me, it's not like the metering is coupled or TTL...but I will continue my search for something pocketable. I found this model and am considering purchasing it. For my intents and purposes it seems perfect. However, I can't seem to find any information on whether it will clip onto an Olympus OM-1. Do you happen to know whether it is compatible? Hello, just found your comment, because i need a light meter for a zorki 4..,you wrote, that the voigtlaender isnt a good match...im curious...why that? The Model 24 will fit on any standard accessory shoe. Hi Kaya, the reason why I said the Voigtlander was a poor match form my FSU cameras was due to the expense. It would function just great, but it seems silly to mount a $200+ meter on a $50 camera. I am hoping to talk to someone with experience with the vivitar 24. how close to actually correct is your "essentially correct" meter in strong light with silver cells? I find mine is great in low light but the needle goes off (up) increasingly the more light is added beyond half way up the scale (even when using 675 zinc air batteries that are the closest to the original 1.35 volts of the original 675 mercury battery).